The Arizona Game and Fish Department is partnering again with the White Mountain Nature Center in Lakeside, Ariz., for this year’s Eagle Fest. The activities start Friday night, Jan. 25, 5:30-7:30 with a film kickoff event at the White Mountain Nature Center. 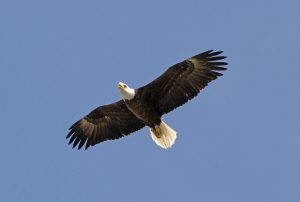 There will be short films from the Arizona Wildlife Views TV show about eagles, eagle management, and the Bald Eagle Nest Watch program, along with short talks from biologists involved in the management of eagles in Arizona. This casual event will also allow you to meet some of the speakers that will be presenting the following day. The Eagle Fest will be held on Saturday, Jan. 26, starting at 9 a.m. with a free program designed especially for children and families. This short program will include live eagles from Liberty Wildlife Center and a presentation about eagles in Arizona by an AZGFD biologist. Bald eagle viewing will be available to all participants on Saturday from 11 a.m. to 2 p.m. at nearby Lazy Oaks Resort on Rainbow Lake to observe bald eagle behavior first-hand, weather permitting. AZGFD biologists and experienced naturalists will be there along with a limited number of binoculars and spotting scopes. Participants are advised to dress appropriately for weather conditions for that day and to bring a set of binoculars or spotting scope for improved observation if they have them. Directions to the viewing location will be available at the White Mountain Nature Center. For questions or more information, please call Diane Tilton at the Pinetop Game and Fish office at (928) 532-3691. For updated information, follow the event on Facebook @AZGFDPinetop and look under events. The White Mountain Nature Center is located at 425 South Woodland Road, Lakeside (south on Woodland off of Highway 260). A $10 donation to the White Mountain Nature Center is suggested for adults.